Canadian startup Busbud, which bills itself as the “Kayak for intercity bus travel,” today announced that it has raised a first $1 million funding round led by iNovia Capital and Real Ventures. Peter Kern, an Expedia board member and managing partner of private equity firm InterMedia Partners, as well as Luxury Retreats CEO Joe Poulin also participated in this round. iNovia Capital’s David Nault and Real Venture’s JS Cournoyer will join Busbud’s board. Busbud was founded in 2011 by CEO Louis-Philippe Maurice, CTO Michael Gradek and Chief Scientist Frederic Thouin and is based in Montreal. The service currently offers bus schedules for travel between a whopping 4,379 cities in 66 countries, is available in 10 languages and supports 15 currencies. 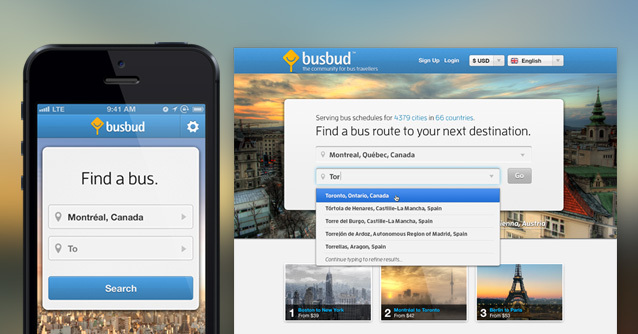 Busbud is available on the web, as well as through an iOS app. Currently, the service has deals with a number of operators to get direct access to their schedules and sell their tickets directly, but for most routes, Busbud still sends you away to their own sites. However, the company tells me that users will soon be able to buy more tickets directly through the service. The company plans to use the new financing to expand its team and also to focus on its international expansion. As Maurice told me earlier, the company really wants “travelers to book tickets wherever they may be roaming in the world.” The team also just moved to a larger office. In most countries, including the U.S., Busbud faces at least a few competitors. It does seems to have a pretty thorough inventory of schedules, however, and in most of the markets I looked at, the service can easily compete with most of its local opponents.